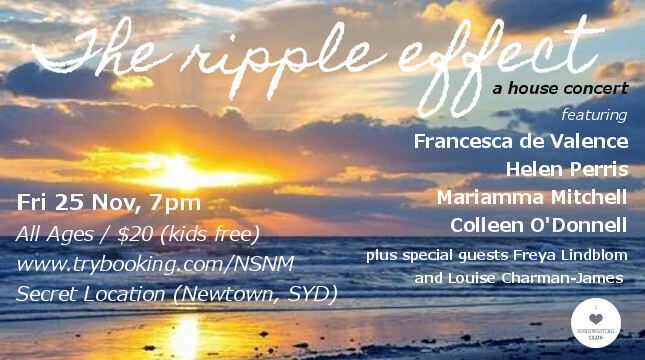 This Friday 25th November, Helen will be joined by Francesca de Valence, Mariamma Mitchell and Colleen O’Donnell, with special appearances by Freya Lindblom and Louise Charman-James for an intimate house gig in Newtown, NSW. This is the first official I Heart Songwriting Club show in Sydney and Helen’s last gig of the year. There will be new songs premiered from all artists! Please join us for an intimate and beautiful night. Be There out on October 18th! Be There by Helen Perris will be released on October 18th, 2016, with a special pre-release download for Perrennials members. Look out for it on Bandcamp, iTunes, and all your regular streaming services. In the meantime, revel in the beauty that is Amelia Carson’s artwork, and enjoy some behind the scenes stills courtesy of Helen Perris and Shondelle Pratt. Track written by Helen Perris and produced by Josh Schuberth of Endomusia Productions at Love Hz Studios. Video produced by Helen Perris and One Dream Media, directed by Michael Garcia of One Dream Media, choreographed by Shondelle Pratt, with makeup and hair by Marnie Gerber.